Gallus has added a 5-color model of its Labelfire hybrid press. The Gallus Labelfire E 340 features CMYK plus digital white, and is intended to provide a different entry point to those looking to produce lowest cost, digital, finished labels in a single pass on an industrial platform. Launched in 2016, the Gallus Labelfire 340 is an 8-color digital production system combining UV inkjet printing with in-line embellishment and converting. The inkjet system, co-developed with Heidelberg, features state-of-the-art, 1200 dpi inkjet heads from Fujifilm. Gallus Labelfire E 340 features the same 1200 x 1200 dpi image quality, without orange, violet and green inks. Gallus stated that the new model can be configured based on the current needs of the customer to provide the lowest cost of entry when it comes to getting started with digital hybrid label printing. 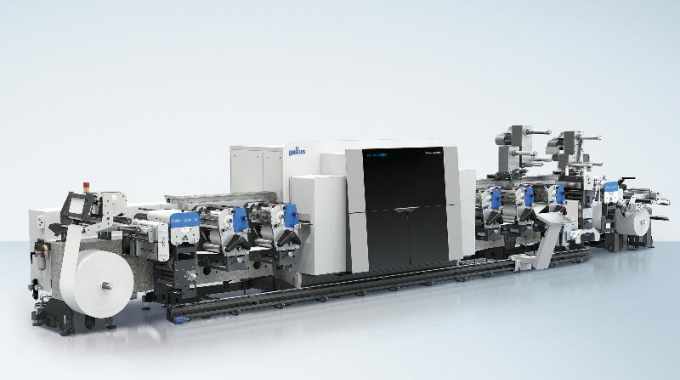 The whole system is integrated into Heidelberg’s Prinect print media workflow. Those customers who purchase the five-color Labelfire will have the ability to upgrade to eight colors and add further embellishing options including screen, cold foil, additional flexo, as the need arises or their business grows. Gallus Labelfire E 340 is available worldwide immediately. Deliveries are expected to start in April.